Real Estate Investment Trusts or REITs are instruments that allow you to obtain exposure to real estate as an asset class without directly owning a physical structure. This is similar to using the gold ETF (GLD) to gain exposure to gold in your portfolio without taking physical delivery of gold bullion. To avoid corporate taxes, REITs generally tend to pay out over 90% of their taxable earnings as dividends. Many flavors of REITs exist including commercial REITs, healthcare REITs, hotel REITs, apartment REITs, etc. In keeping with the carnage in the real estate sector, REITs have lost over 70% of their value over the last two years. Despite such a precipitous drop, I still will not touch the sector with a ten-foot pole. With occupancy rates running around 95%, apartment REITs appear to be the one bright spot in this sector and the sharp drop in prices has left many of them very attractively valued as discussed in the valuation section below. With over 50,000 apartments in 178 communities, AvalonBay is one of the largest apartment REITs in the country and a company I have had direct experience with as a renter. The company generates nearly half its net operating income from the NY/NJ metro area and New England. California represents an additional 32% of net operating income with the rest coming from the Pacific Northwest and the Mid-Atlantic/Midwest regions. With a management team that is well respected and leverage that is the lowest of any apartment REIT, AvalonBay has traded at a premium over the last few years and the stock was trading at nearly $150 when I first came across the company in early 2007. Even after declining through most of 2007, the stock was close to $110 when I mentioned it in the blog post Quest For A 6% Yield on 10/20/2007. At those lofty levels AvalonBay was offering a cash dividend yield of just 3% and I could not justify investing in the company when it was possible to earn a similar or better return from cash without any risks. I continued watching the company over the last two years looking for an opportunity to start a position. With a decline of over 70% from its 2007 high and a yield of 8.1%, this apartment REIT is finally at a level that not only offers a fat yield but also the potential of price appreciation. Both AvalonBay and AIMCO are amongst a group of 13 REITs that are included in the S&P 500 index. I guess at any other time, this inclusion would have reflected upon the quality of these companies but with financials representing nearly 10% of the S&P 500 index and other index constituents floundering (E*Trade and Sprint come to mind), it is hard to make that case for quality anymore. There are some very valid concerns about investing in REITs at this time that are related to occupancy rates, the safety of the dividend and debt that is coming due this year. Let me try to address these risk factors below. 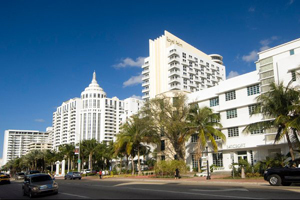 As of the end of December 2008, the occupancy rate at AvalonBay was 95.5% and is expected to be around 94.5% in 2009 after having started the year with an occupancy rate of 95.3% in January. AvalonBay benefited early in this real estate correction as the number of renters increased because housing became unaffordable, loan requirements tightened up and a wave of foreclosures hit the country. However apartment REITs are now feeling the impact of the economic meltdown because of job losses and are likely to face a tough operating environment in 2009 and potentially into 2010. Beyond the softness experienced in the fourth quarter of 2008, Avalon expects revenue to decline between 1.5% to 3.5% and net operating income to decline between 4.25% to 6.25% for 2009. However the company is not clamping down on growth and expects to complete 8 out of the 14 communities it currently has under development in 2009. Current low interest rates have been favorable for AvalonBay as the company partially used new debt to retire higher interest debt and reduced the interest rate of its portfolio from 6.5% at the end of 2007 to 6% at the end of 2008. Avalon expects further interest rate related gains in 2009 by repurchasing 7.5% medium term notes due December 2010. The important criteria here is determining if the current dividends and yields are sustainable in a challenging rental environment. AvalonBay expects to retain $75 million in free cash in 2009 on net operating income of $550 million. Even if their net income declines an additional 10% beyond the 4.25% to 6.25% decline they have already modeled into their 2009 estimates, they would still have enough cash flow to pay the dividend on the common stock and I believe the dividend appears to be safe for 2009. I can certainly make peace with a 8.1% yield from a high quality company while waiting for the eventual recovery to occur. Avalon raised $1.9 billion in capital in 2008 including $1.2 billion in new debt. Yet their leverage at 44% remains modest by industry standards. The company plans to raise an additional $750 million in debt in 2009 and has liquidity arranged or identified to meet all capital needs through 2010. The company ended 2008 with $259.3 million in unrestricted cash and cash in escrow. It also has the ability to tap into a further $124 million of a $1 billion unsecured credit line. Total debt that matures in 2009 is $267 million. Another apartment REIT worthy of consideration that appears to be given up for dead by most investors is Apartment Investment Company or AIMCO (AIV). Depending on which financial website you use, you might see the yield ranging from as high as 109.2% (MarketWatch) to 40.9% (Yahoo Finance). The actual cash yield of AIMCO is 17.92% based on management’s decision to drop the dividend payout to $1 from $2.40/share. The number reported by Marketwatch.com is probably higher because AIV also declared a stock dividend due to profits generated from asset sales. The REIT has dropped a precipitous 91.33% from its February 2007 peak of $64.35 due to concerns about the highly leveraged nature of the company and recent changes in management leading to the resignation of its CFO. Trading below book value and at a discount to its peers AvalonBay, Equity Residential (EQR) and Essex Property Trust (ESS), the risk/reward trade off looks appealing for AIMCO. I am probably not the only one feeling that way as a director of the company purchased 150,000 shares for $922,550 on the open market last week. There have also been a series of open market insider purchases at Essex Property Trust in the last two weeks. A special metric called Funds From Operations or FFO is used by REIT investors and analysts to evaluate REITs instead of relying on standard financial metrics like net income or EBITDA (Earnings Before Interest, Taxes, Depreciation and Amortization). FFO is obtained by adding back expenses like depreciation to net income and excluding any income derived through the one-time sale of assets. FFO = Net income + depreciation – gains from sale of assets. FFO is preferred as a valuation metric because it gives a better picture of cash flow from operations than net income, which includes non-cash related expenses such as depreciation and amortization. Some analysts prefer to use another metric called Adjusted FFO, which subtracts capital expenses that are required to maintain the portfolio of properties and amortization from net income to give an even better picture of true cash flow generated from operations. Capital expenditure or Capex is normally added to the value of an asset on the balance sheet and then depreciated on the income statement over the life of the asset. Earnings yield of REITs is obtained by dividing Funds From Operations (FFO) by price. The earnings yield of the S&P 500 is defined as earnings divided by price, essentially the inverse of the P/E ratio. I have expanded upon each of these metrics below. Historical Dividend Yields of REITs: With the exception of November 2008 when REIT yields jumped to 10.22%, you have to go all the way back to January 1991 to find yields that were greater than current levels. Interestingly that was right in the middle of the 1990-1991 recession, partially precipitated by the real estate led savings and loans crisis. 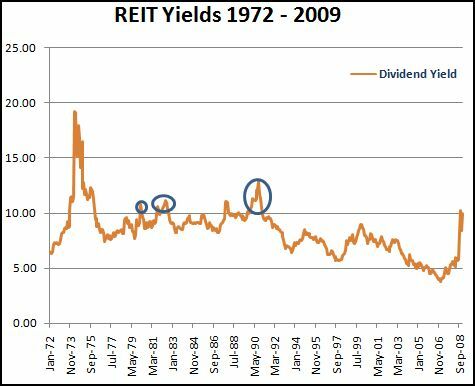 As you can see from the chart below, with the exception of the high inflation period in the early 70s, REIT yields have spiked above 10% only three times over the last 30 years. Dividend Yield vs. 10 Year Treasury: As of Friday, February 20, 2009, the yield of the 10 year U.S. Treasury note was 2.78% (http://www.ustreas.gov/offices/domestic-finance/debt-management/interest-rate/yield.shtml). Using the iShares Dow Jones US Real Estate ETF (IYR) as a proxy for REITs, the current yield of IYR is 9.88%. The spread between the 10 year note and REIT yields is an astounding 7.1%. Even if you use the MSCI U.S. REIT index and the Vanguard REIT Index Fund (VGSIX), the yield is still 9.76% and the spread 6.98%. REIT Earnings Yield vs. S&P 500 Earnings Yield: With 93% of companies reporting fourth quarter earnings for the S&P 500, earnings for 2008 were $26.16 (Q4 earnings are -$11.97). Instead of using reported earnings, I am going to use operating earnings for the S&P 500 to calculate the earnings yield as it would take out of the effects of one time charges, write offs and loan loss provisions. It would also level the playing field because we are going to use FFO for the REITs instead of net income. Based on Friday’s close of 770.05 and operating earnings of $54.60, the operating earnings yield for the S&P 500 works out to approximately 7% (earnings yield utilizing reported earnings would have been 3%). Since I do not have access to the FFO for all the REITs in the Dow Jones REIT index, the S&P 500 earnings yield is compared to the earnings yields for some of the apartment REITs we are considering in the table below. The REITs compare favorably with the S&P 500 earnings yield despite the use of operating earnings for the S&P 500. One could easily make the argument that FFO for apartment REITs are going to fall in 2009 but if you look at the “numbers” section below, you will notice that with the exception of Essex Property, FFO is expected to be close to or above 2008 numbers. Having read the recent quarterly call conference transcripts of (thank you Seeking Alpha) these REITs, I can say that management is well aware of current conditions when coming up with these estimates. Taking these metrics into consideration, REITs look very attractive at current levels. Past performance may provide some insight but is not indicative of future returns. Keeping the current economic situation in mind, it would bear repeating that I would not touch most REITs with a ten-foot pole. However with occupancy levels around 95% as of the end of January 2009 for many apartment REITs, this particular sub-sector looks very appealing at current levels. Voluntary Disclosure: I currently do not own any positions but plan to initiate a position in AvalonBay after this special report is published. Capitulation or Just Another Leg Down?